Coral, an endangered olive ridley sea turtle that was rescued from an Oregon beach and rehabilitated at SeaWorld San Diego, is back in the ocean for a second chance at life. The turtle was found stranded on a beach near Salishan on the Oregon coast on Oct. 20, taken to the Seattle Aquarium and then flown to San Diego on Jan. 26 aboard a Coast Guard plane. 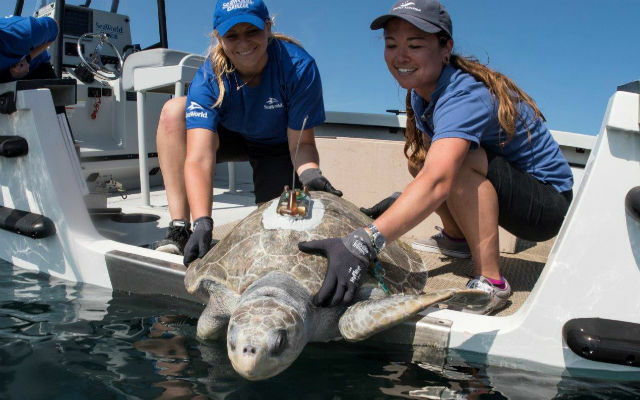 Coral was taken to SeaWorld because it is the only facility on the West Coast capable of providing long-term rehabilitative care for sea turtles. The turtle was released into the Pacific Ocean approximately 10 miles off the coast of San Diego on Aug. 1. Scientists at the Hubbs-SeaWorld Institute attached a satellite tracking device so that researchers can follow Coral’s movements at sea. SealWorld officials said it was especially important to rehabilitate a female turtle like Coral to help sustain the endangered species’ population.